Tourism and Refugees in Turkey – Mega-yachties to the rescue! Income from the tourism industry, as we all know, is a two-edged sword. In the post-modern era, First World nations have ‘outsourced’ most of their manufacturing industry and obtain most of their natural resources from abroad. If their people want work, the tourism sector is a big provider – a kind of serfdom to the wealthy globetrotter. It’s the same deal in poorer countries where little of the income from resource exports trickles down from the governing elite. Poor natives need the tourist dollar to feed themselves and their families; and rich natives despoil the country’s natural beauty building opulent pleasure palaces to insulate visitors from the realities of local poverty. I saw a ship go sailing by . . . So I read with mixed feelings a report in today’s newspaper that tourist numbers in Turkey are down 10% or more this year. In Antalya, hotspot of the Mediterranean coast, revenue losses amount to an estimated $2 billion so far. In our very own Bodrum, visitor count is 12% less than at the same time last year. In fact I would think that is an optimistic measure. Of necessity we visited the marina township of Turgutreis on Saturday – normally a day to avoid since the weekly market draws large crowds and crazy traffic. Well, I can’t say it was like a ghost town, but for sure the expected feeding frenzy failed to materialise. We conducted our business, enjoyed a leisurely breakfast at a seaside café and escaped with a minimum of stress. So what’s changed? The sun is still shining and the sparkling Aegean is still reflecting the endless blue of summer skies; crimson bougainvillea still frame the pristine white walls of village houses, holiday villas and B&Bs; the local beer Efes Pilsen is still being served in nicely chilled glasses and cholesterol-laden deep fried English breakfasts are still served well into the afternoon. 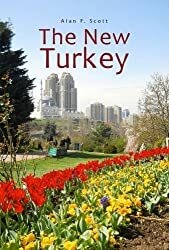 Possibly the flood of propaganda in foreign news media that Turkey is ruled by a megalomaniac dictator (totally untrue) is starting to influence travellers. Perhaps news of the chaotic situation across the border in Syria is persuading European sun-seekers that the beach at Bognor Regis could be a safer option. For sure that’s a bad business. The United Nations Commissioner for Refugees informs us that 1.7 million Syrians are registered as having entered Turkey since civil war broke out four years ago, and another 300,000 have slipped past border controls. Camps set up by the government are providing basic needs for around 200,000 at an estimated cost of $3 million a month. Where are the other 1.8 million, half of whom are said to be children? Struggling to survive as best they can on the streets, in the parks and derelict buildings of Turkey’s cities from Gaziantep to Istanbul, working when they can, begging and maybe stealing when they can’t . . . What would you do? To put it in perspective, two million is a little less than the population of Houston, Texas, and a little more than Philadelphia, PA, the USA’s 5th largest city. In the United Kingdom it would be Number Two, behind London and ahead of Birmingham. And those people aren’t tourists coming to check out the delights of Turkey’s beaches and nightspots. Many of them were middle class people in their homeland with jobs and houses of their own. They left because life became impossible in a country on which the US military has reportedly been dropping $7 million worth of high explosives every day. Still, I don’t blame Americans. For the most part, they have to believe what their government and news media tell them. And most of them I’m sure, are well-meaning people. A friend of ours over there had an interesting idea the other day for a documentary film. The concept was to research the lives of the nine people killed in the church shooting in Charleston, South Carolina last week, in a worthy attempt to personalise the tragedy and perhaps reduce the level of race hatred by showing that African Americans are people too, just like us. Well you could, I guess, squeeze the lives of nine people and their families into an hour-long documentary. Impossible to do the same for the tens of thousands who have died in Iraq, Syria and Palestine in recent years. Impossible, so best not to even try. In the mean time, the people of Turkey are struggling to look after those two million refugee Syrians. Angelina Jolie, I understand, has come for another look at the situation. Let’s see what comes of that. But getting back to Turkey’s other problem – the fall-off in tourist numbers. It does seem that the ultra-rich citizens of the world are stepping in to take up the slack, so let it not be said those guys (and girls) don’t have an altruistic bone in their bodies. Just the other day I watched a large, streamlined blue and white vessel motor serenely past between the Turkish coast and the nearby Greek islands. Even with the disadvantage of perspective, it seemed to dwarf the houses on the shore, and I couldn’t resist the urge to take a picture. 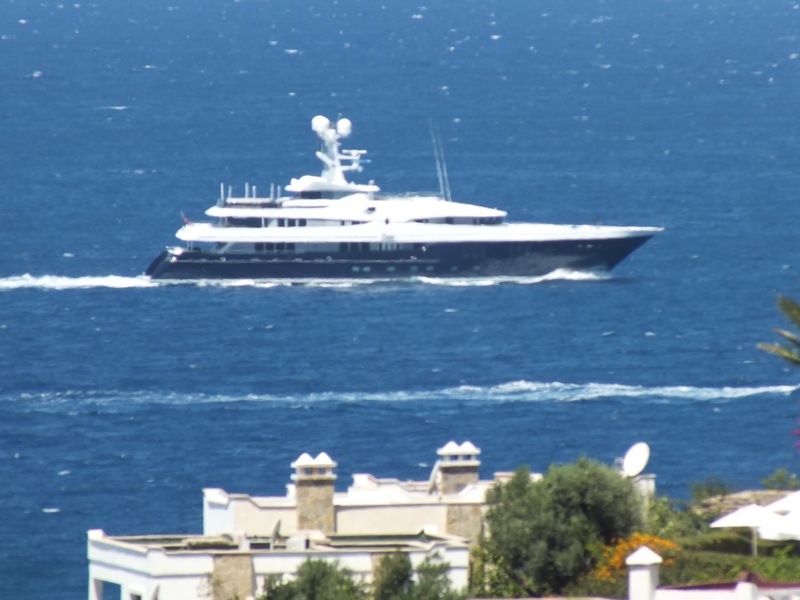 The next day I read in our local rag that a certain Omar K Alghanim was currently cruising around the Bodrum coast in his mega-yacht Samar. Mr Alghanim is, apparently, scion of a Kuwaiti family that holds the Gulf agencies for Acer, Yamaha, Sony Ericsson, Samsonite, Samsung, Siemens, Nokia, Motorola, Kenwood, Fujitsu, IBM,Dell, Casio, Cannon, Daewoo, Electrolux, Compaq, Minolta, Philips, Toshiba, Whirlpool and Xerox (among others), as well as owning Gulf Bank, chosen by The Banker magazine as ‘Bank of the Year’ in 2012. Wouldn’t you love to know what a bank has to do to win that award! Anyway, Alghanim’s boat Samar is a 77-metre (252 ft) luxury motor yacht designed inside and out by two guys I hadn’t heard of but you can check them out here. It has a helipad, a large spa pool, swimming pool, an open air bar, large deck areas, a side garage, as well as a movie theatre. 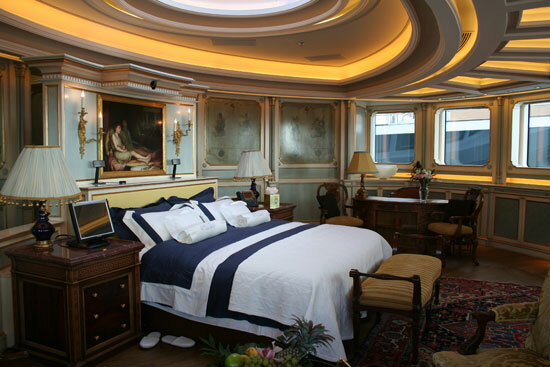 The vessel is capable of extended global cruising, with a range of 6,000 nautical miles and cold storage provisions for 44 people (32 of whom are crew). When Omar’s not using it himself, I gather he hires it out for a modest 650-675,000 euros per week, so if you’re looking to impress a girl or a business contact, you could do worse than take him or her out for cruise on Samar. According to a site I found discussing Who is buying up the USA, apart from the boat, and I guess a nice little pad in Kuwait, the guy owns a 1,600 m2 (16,000 sq ft) mansion on 15 81st Street, NY, and a 20 ha (48 acre) estate named Sassafras in Lloyd Harbor, Long Island. Where do you go after you’ve been to Nirvana? After checking out the pictures Google turned up, I realised Samar is all white, so it couldn’t have been the boat I saw. However, today’s paper turned up another possibility. It seems a second mega-yacht has been spotted in the area, and this one is white with a blue hull. 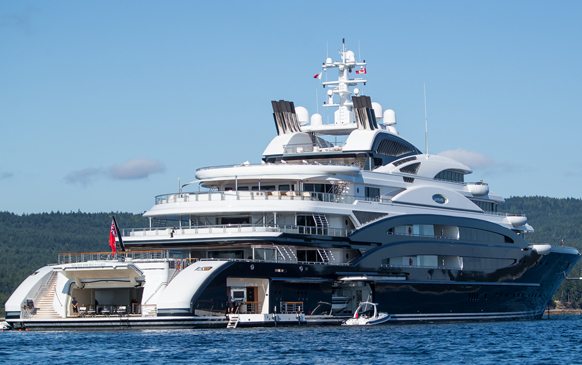 Going by the spiritually optimistic name of Nirvana, it is allegedly owned by Alisher Burkhanovitch Usmanov. Without the Russian suffixes, Alişer Burhan wouldn’t raise an eyebrow in Turkey – and his online bio tells me he was born a Muslim in Uzbekistan, though he subsequently married a Jewish lady. Forbes and Bloomberg disagree as to whether he is the 58th or the 37th richest guy in the world – but all agree he is Number One in Russia, owns two modest properties in the UK, ‘Sutton Place, Surrey, the former home of J. Paul Getty, in addition to a £48 million London mansion’, and a 30% share of the Arsenal Football Club. As one might expect, there are some questions about how Mr Usmanov made his pile, and Wikipedia reports that he served six years of an eight-year jail sentence back in the 80s. It’s not easy to get details, however, as the Uzbek gentleman’s lawyers have managed to get just about all references to it removed from newspaper websites, archives, blogs and Google search. Well, from my understanding of Buddhist philosophy, that mega-yacht may be Alisher Bey’s best chance of attaining Nirvana. Nevertheless, some might argue it’s worth taking the risk. The boat is 88 metres (271 ft) long and sold for 199 million euros. Wonder what he did with the one million change he got from his two hundred million-euro note? Left it as a tip maybe? This time the colours were right, but again, a close comparison with the photo I took seemed to suggest that the vessel I saw wasn’t Nirvana either. And, big as my one was, I suspect it wasn’t quite in the 77-88 metre class. Looks like, with the competition around Bodrum at the moment, whoever owns that one didn’t warrant a mention in the local press. Anyway, Dilek and I are pleased to know we won’t have to rescue Turkey’s ailing tourist industry on our own. This entry was posted in Economics, refugees, tourism in Turkey and tagged Economics, International affairs, Middle East, Syrian refugees, tourism. Bookmark the permalink. A point of clarification. I don’t know how many of your friends had the idea to make a documentary about the last day of the nine people killed in Charleston, but as it was an idea that I posted on Facebook, I will say that my intent was not to show that African Americans are people just like us, as you suggest. As the names of these individuals surfaced, along with information about their work and their families, it became evident that this was a remarkable group of individuals whose deaths represented the abrupt end of their capacity to influence the community in tremendously positive ways, whether it was by encouraging kids to read or by lending a hand to whomever might need it. When these types of tragedies occur, too often they become sound bites and the deeper reality of the individual life is lost in the clamor over gun control or flags, in this case. I have been struck, too, by the same awareness of the loss of potential among the refugees whose lives have been diverted from flourishing in productive work and family/community contributions to obtaining the bare necessities required to stay alive. These losses in their various forms require a deeper awareness of the individual stories. And yes, you are correct in saying that it was an idea that would help to personalize the tragedy. Also to move it away from being a story about the killer, whose life has received much more scrutiny than the lives of those individuals who welcomed him into their circle, with the exception of Senator Pinckney. This event has galvanized the country and we shall see how long we can sustain our ability to effect real change. Regarding tourism, my cousin and good friend will be arriving in Istanbul next week to sail on one of those yachts on the Bosphorus and and then through the Greek islands. So, as he will be with his wife, that will be at least two people swelling the tourism numbers. Last year I did have a conversation with a friend who intended to go to Turkey with three others. She was hesitating not because she was fearful but because it pained her to take a carefree and relatively luxurious trip to Turkey knowing of the suffering of the refugees. It felt cognitively dissonant to her. She did end up going. Have not had a chance to catch up with her to hear about it. I wonder if it’s possible to discern what nationalities are traveling less in Turkey. Thanks for the feedback, Margie. As you say, it’s only when we learn personal details about the lives of people affected by these tragedies that we are able to understand the true human impact – and sad to say, with so much tragedy in the world, it is hard not to be overwhelmed by the sheer numbers of sufferers. Any attempt to focus on the victims as human beings with jobs, spouses, children, mortgages, family photo albums, feelings and emotions is surely worth while.